It was with a great deal of heaviness in my heart that I read about Elijah Harper’s passing yesterday. It is a difficult thing to be called to leadership in life before you feel ready. It doesn’t matter what the scale of your leadership is; when your values make you passionate about catalyzing positive change in your life and the lives of others, the weight of what’s before you often feels heavy. You want to be prepared. You want to do justice to the trust people put in your ability to come through. One of the things that gives you courage is the transition between different generations. You know that you’re walking the traplines laid down by your predecessors. You know the brushtrails have been cleared for you, and that it’s your turn to take to those trails and seek sustenance for yourself and your people. It’s your time to walk through the landscape of power that the heads, hearts and hands of your ancestors and your teachers created for you. You want guidance. And you want the opportunity to give gratitude to those who provide it. The man in this image is Elijah Harper. He went on ahead to walk with the ancestors yesterday, and though my heart is heavier for it, I know they’re celebrating to have him in their midst. I did not know him personally. But he is someone who has guided me, and I’d hoped to someday have the opportunity to give him my gratitude for it. I’m not going to tell his story here. I’m not going to eulogize him. His life and leadership deserve more eloquence than I can provide. He is and always will be, for me, a symbol of the power you can wield and the change you can make with courage and an eagle feather in your hand. He is, in a very large way, one of those incredible people who gave this gift to my generation: Reclamation of our sovereignty as indigenous people is not a dream, but a possibility. 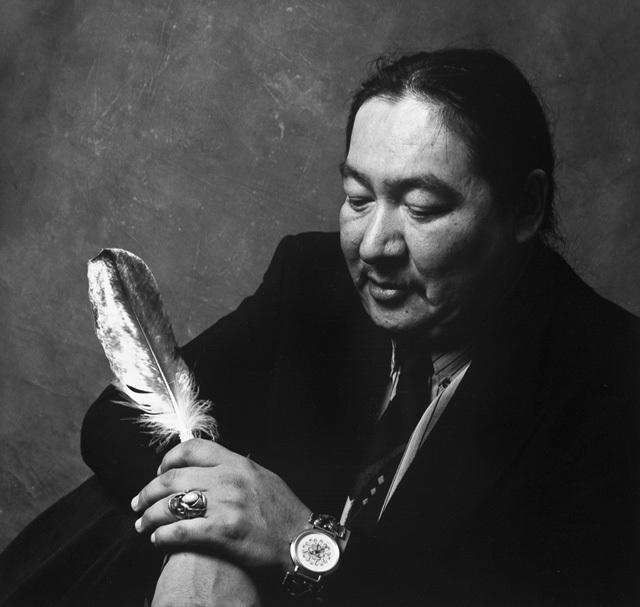 And with courage, and an eagle feather in our hands, we can help to realize the things he fought for his whole life. May he continue to guide us and feel our gratitude carried up on the sacred smoke. This entry was posted in Indigenous and tagged Elijah Harper, leadership, Meech Lake Accord. Bookmark the permalink.